This is the most amazing kitchen tool I have come across since my Vitamix. I love young Thai coconuts but I never buy them because I don’t own a machete and I am afraid to use my knives. Well that has changed as of right now. 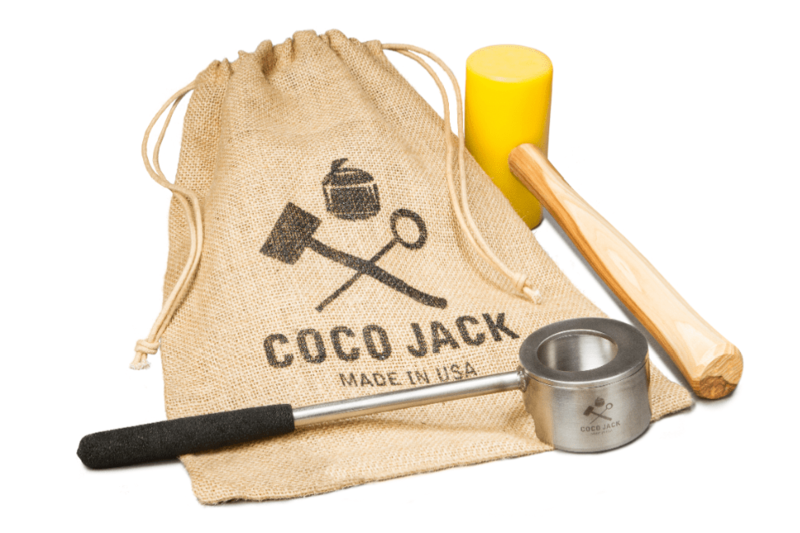 My son and I watched the videos on The Coco Jack website and saw how easy it is to open a coconut – even for a 4 1/2 year old kid! Not only is it easy to open the coconut and access the water, but Dave, the inventor of The Coco Jack, invented the coco scoop, which gets nearly all the meat out of the coconut in one scoop and the coco noodler with which you can create fettuccine and angel hair coconut noodles. Must come up with cool recipes for those! Now we can have fresh coconut water and Maple Coconut Pudding any time. No more Zico or Coco Libre for us! Wow, I am super impressed. Dave even has recipes on his site and I am going to be making Raw Coconut Yogurt asap. i have no idea what i would do with coconut noodles. maybe like a raw pad thai?? get the coco jack and let’s compare notes. and thanks for the shout out! !